Ryan Blaney and the crew of his No. 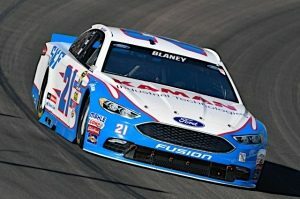 21 SKF/Kaman Industrial Technologies Ford Fusion spent most of Sunday’s Can-Am 500 at Phoenix International Raceway working to make his car handle better. The hard work paid off in the end as Blaney surged forward in the closing laps to finish eighth, his ninth top-10 finish of the 2016 season. Blaney started eighth and struggled in the early going. By the time the race reached the final 50 laps he was still outside the top 10. But he and his crew benefited from several late-race caution periods and worked their way into the top 10. Then, when a caution flag for a crash by Michael McDowell set up an overtime finish, Blaney moved into the top 10 and survived two restarts to finish eighth. Ironically, an unscheduled pit stop to tighten a loose lug nut turned to the team’s advantage when the team took the opportunity to put on new tires. That allowed Blaney to finish the race on fresher rubber than he otherwise would have. Wood joined his fellow members of the No. 21 SKF/Kaman team in congratulating their fellow Ford team members at Team Penske on the victory at Phoenix by Joey Logano and the No. 22 team. That win puts Logano and the No. 22 team in position to compete for the Sprint Cup championship during the upcoming Ford Championship Weekend at Homestead-Miami Speedway. “We enjoyed seeing how excited Mr. Ford was to see Joey win in a Ford and be able to represent the Blue Oval in the Ford Championship Weekend at Homestead,” Wood said.